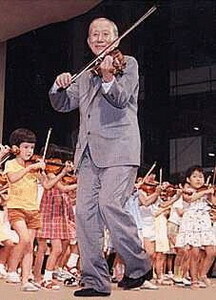 The son of a violin maker in Nagoya, Japan, Shinichi Suzuki became interested in music at the end of his adolescence by listening to records and trying to reproduce melodies himself. During a long trip to Germany for his studies in the late 1920’s, he studied violin with Karl Klinger who was then a professor at the Berlin conservatory. He also became friends with Albert Einstein who had a profound influence on him. Confronted with the problem of learning a foreign language he was lead to question the mecanisms for learning the mother tongue and the similarity of this process with the learning of a musical instrument. He observed that a long period of listening is necessary before the reproduction of language and also that listening continues even when the child begins to talk. He noticed that a positive attitude on the part of the family provides essential stimulus for the child’s development of language. Furthermore, daily practice of language is also one of the reasons that we speak with ease. Music is just a short step away from the « mother tongue » concept. In both cases we are in the world of sounds. 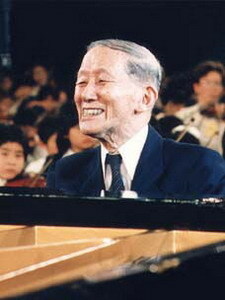 From the 1950’s on Shinichi Suzuki encouraged his students to listen regularly to works of great composers and to the works he wished to have them study. The results were surprising , the students learned much better than before. Also, having already realized the impact of the environment on the learning process, he asked mothers to attend lessons and to pursue practice at home. 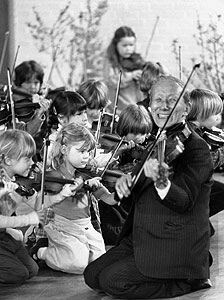 He even taught them the basic rudiments of the instrument. The results exceeded his expectations. Students felt supported in their studies and it was not long before they mastered well known repertory such as the Bach double concerto. There were other determining factors in the elaboration of this pedagogy.Younger sisters and brothers who attended lessons also wanted to learn. Suzuki noticed that they learned twice as fast as their older siblings. He established the ideal age for beginning at 3 to 5 years. 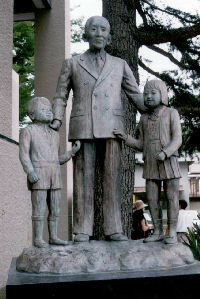 Observing the behavior of young children, Suzuki noticed that they express themselves with short rapid gestures. He accordingly wrote the famous variations on the popular « Twinkle, Twinkle, Little Star » theme by Mozart, in which the rythms are more appropriate to the child’s natural means of expression. 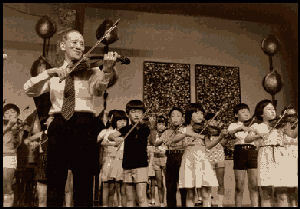 He insisted that the children memorize the pieces to improve the quality of musical expression and enhance their capacity to memorize as they learn subsequent pieces even more easily. « Mastery generates mastery ». He recommended regular replaying of pieces the students already knew in order to improve musical expression. For Suzuki this is the means for acquiring talent. He observed that students are more motivated when they study the pieces together. The group with games and fun became an important pedagogical tool. This complimented the individual lessons and facilitated assimilation of technical exercises which had been repetitive before. 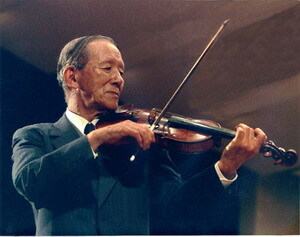 Shinichi Suzuki recognized that certain students progress faster than others, however one point became certain for him . Providing an environment of quality enables a far greater number of children to succeed. His research went farther and led parents and educators to notice the point at which a positive or negative view of the child can influence or stimulate. Thus, if a mother or father is certain of his child’s capacity to succeed, and regularily encourages him/her, the child becomes confident and can accomplish much. 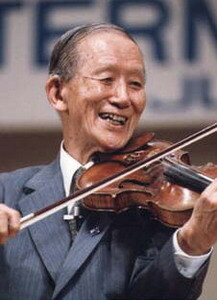 Suzuki’s work has had an impact all over the world ; his approach is applied in more than 50 countries . In Europe, a team of teachers who worked under his direction in Japan, created in the 1980’s the European Suzuki Association which presently includes 18 countries. While pursuing his work this very active team has also helped the pedagogy to evolve and open toward other musical styles : ethnic, jazz, traditional. Thousands of children can appreciate music in a more attractive way without neglecting the importance of rigor. With their parents they benefit from an approach which aims as much for human as for musical development. This larger educational view has allowed a much greater number of children to play an instrument. The teaching method developed by Shinichi Suzuki is based on the same concept as the learning of the mother tongue. His pedagogy has expanded into an international movement which has contributed to the evolution of theories of childhood education. Dr. Suzuki, through his devotion and humility, inspired a new pedqgogy which, from Australia to the United States, from South Africa to Scandinavia, is taught today to nearly a million children. He continued to share his pedagogy until his last breath in January, 1998. The method is not only pedagogical but also philosophical. It is based on respect for the child as an individual and on the concept that aptitude is learned, can be developed and especially that it is not hereditary. 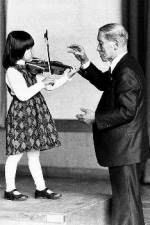 Suzuki called his method « talent education » because he considered talent to be nothing more than the development of capacities already present in the child. His work has shown that the average capacity of an individual is much higher than commonly thought. If the method provides the means to bring together hundreds of children on stage, it is because talent is not reserved for a few exceptions. Quite the contrary, it has been developed beyond expectations in each of these children. Other than learning an instrument, talent education has many advantages. Children can begin at an earlier age (3 to 4 years) than that which traditional systems consider appropriate. They will have reached a high level of skill at an age where they are traditionally considered ready to begin. Progress is not dictated by pre-determined goals. If he is respected and encouraged the child himself will generate progress and this brings him fulfillment and stability. Children who have started very young learn more profoundly and play with more ease. The repertory is repeatedly played at home as well as in groups. This capacity to memorize is an essential step in the development of the mind and for acquiring ease of expression. From the beginning the child learns to memorize and repeat rythm and melody by listening. Gradually the pieces become longer and the repertory expands to the point where students are able to play concerts of over an hour from memory. They progress with what they have known and mastered for a long time and from this they acquire precision.